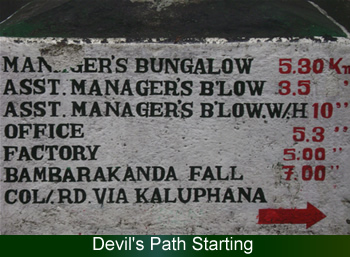 The road from Horton Planes to Kalupahana is named as Satan's Steps'. Satan's Steps' name is given by the English Planters of the Colonial days who made this road. Because of its numerous Hairpin Bends, steep climb and the devilish nature. 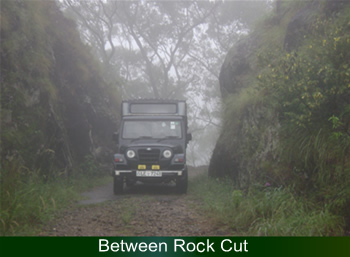 From Horton Plains exit, you will be driven 6 km by vehicle to start the Colonial Trek. 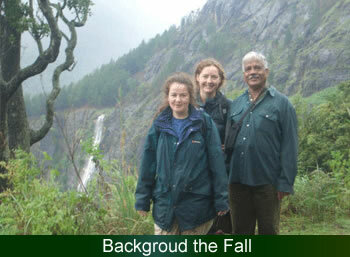 Trek start from Udaweriya Estate junction, in Ohiya - Horton Plans road. 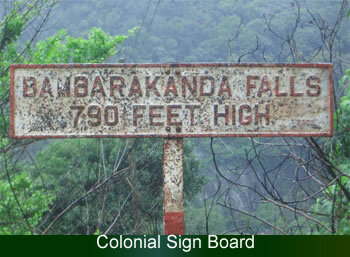 Distance to Bambarakanda Falls from the starting point is about 14 Km. Passing view of the steep drops of the World's End, tea plantations and tea factories, tea picker's colonies, crystal clear water streams, fauna and the flora. The Devil's Staircase, which a stone barrier cut through, the Satan's steps road by the British is a highlight of the Colonial Trek. 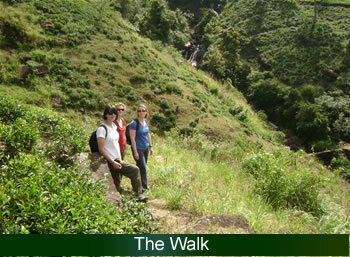 Bambarakanda Falls is situated within a majestic basin shaped valley bordered by huge steep rocks and dark green reforests of pines and tropical trees. 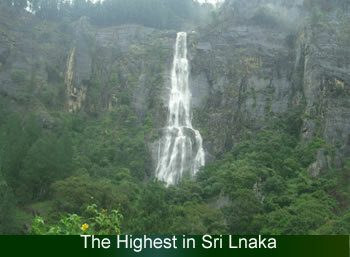 This highest waterfall of Sri Lanka (240.8M) with two silver ropes over a vertical dark gray wall from the green saddle between Mt. Welihena and Mt. Bambaragala into a deep pool only 500 M walking distance from the main Colonial Trek. From the falls drive another 6 km by vehicle to Kalupahana in the main road.